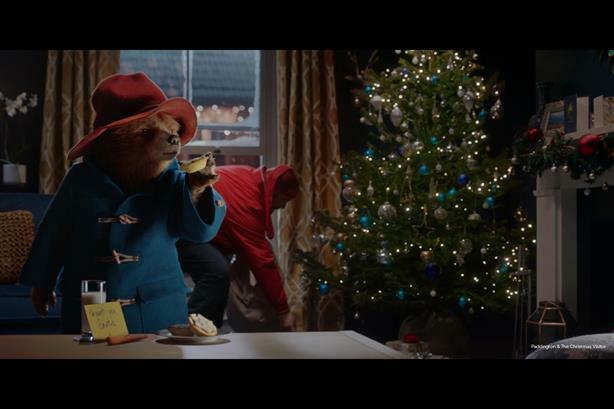 Marks & Spencer has revealed its Christmas campaign; a heart-warming caper that follows Paddington Bear as he unknowingly stops a burglar and saves the day for his family and neighbours. 'Paddington and the Christmas Visitor' will air on TV this evening (7 November) during the Pride of Britain Awards on ITV, and versions of the film will play throughout the festive period across social media. The caper opens with Paddington Bear fast asleep on Christmas Eve. However, his dream about marmalade is interrupted by a thud on the roof. Upon investigation, the iconic bear stumbles across a burglar in a red jacket who has a sack full of stolen presents. Despite the burglar insisting that he is not Santa, Paddington helps "Mr Claus" re-deliver the presents to his family, friends and neighbours, unknowingly saving Christmas for the residents of Windsor Gardens. Marks & Spencer brand and marketing director Rob Weston said: "Paddington injects the sense of joy, love, and neighbourly spirit that makes Christmas feel magical and our story reflects the inclusive, 'make the most of every moment' approach that we take to our customer conversations." The campaign, which has Marks & Spencer's 'Spend it Well' brand slogan at its heart, was created by advertising agency Grey London and includes a cameo from veteran broadcaster Angela Rippon. The agency has also created a subtitled version of the film for Facebook. Versions of the ad will also preview ahead of screenings of the feature film Paddington 2, which is out in the UK on 10 November. PR agency Premier's Partnerships Division helped bring together film distributor Studio Canal, Paddington Bear and Marks & Spencer. Patrick Bousquet-Chavanne, executive director of customer, marketing and M&S.com at Marks & Spencer, said: "Paddington has enchanted children and families all over the world for nearly 60 years, which is why we couldn't turn down the chance to bring the wonderfully endearing, much-loved British character and his world into the heart of our Christmas campaign." Marks & Spencer said it hoped to carry momentum for the integrated campaign throughout November and December via a series of reveals. These include interviewing Paddington Bear for its content hub Style & Living, as well as publishing unique GIFs and clips across social media designed to encourage users to share the hashtag #LoveTheBear. The retailer has also created dedicated Paddington Bear concessions in 78 of its stores. These will stock almost 90 Paddington-themed products, including several that are exclusive to M&S. Marks & Spencer has also created a Children's storybook that follows the story of Paddington and the Christmas Visitor, which is available in stores and online for £3 from this week. £2 from each book sold will be donated to the NSPCC to help fund Childline services during the Christmas period. Weston said the retailer hopes to raise at least £200,000 for the charity.